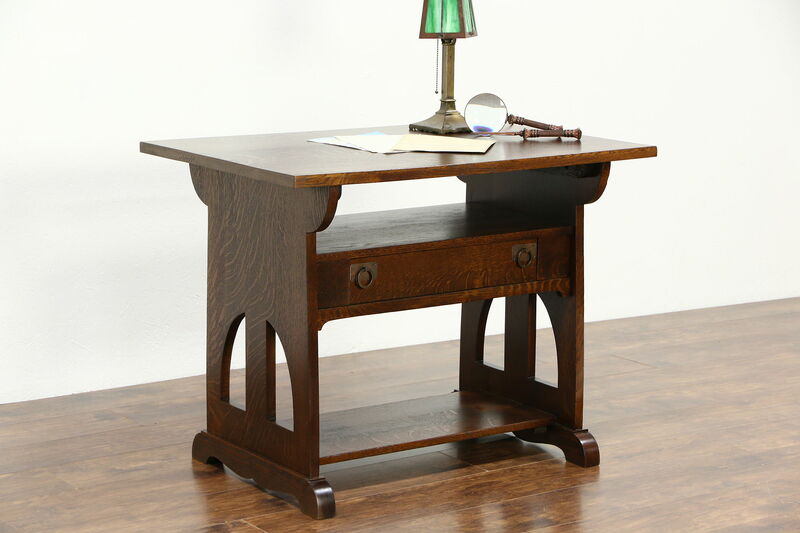 From the Arts and Crafts or Mission Oak period about 1905, this library table was used to hold rolled maps and Great Lakes charts at a Wisconsin shipping company. Open shelves would also make this table useful as a TV console. Solid quarter sawn oak, the restored deep finish is in excellent condition. The drawer has original hammered coppery hardware and dovetailed joints on this American made antique Craftsman furniture. Upper and lower shelves held rolled maps. Dimensions are 38" long, 26" wide and 29 1/2" tall.